Due out on October 3. Microsoft and Turn 10 announced Forza Motorsport 7 for Xbox One and Windows 10 PCs at the Microsoft E3 2017 press conference. It will launch on October 3. With Forza Motorsport 7, everyone can experience the danger and beauty of competitive racing at the limit. Enjoy gorgeous graphics at 60fps and immersive true 4K resolution in HDR. Collect over 700 Forzavista cars, including the largest collection of Porsche, Ferrari, and Lamborghini models available in any racing game. Master over 30 famous environments with dynamic conditions that change every time you race. Xbox One and Windows 10 PC players can also race with each other through cross-play. Immersive True 4K Gaming – Built from the ground up to be UHD at 60 frames per second, Forza Motorsport 7 is the premiere 4K gaming experience. Dynamic Race Weather – Intense rain, expanding puddles and limited visibility make this the ultimate test of bravery and skill behind the wheel. Unrivaled Car List – Collect and drive more than 700 cars, including the largest collection of Porsche, Ferrari and Lamborghini models available in any racing game. Tracks Come Alive – Master 30 racing environments with over 200 ribbons in Forza’s largest track list ever. No two races are the same as race conditions change each time you return to the track. A Brand New Campaign – Experience the premiere racing championship in the Forza Driver’s Cup, where you battle thousands of Drivatars to earn trophies and become the Forza Driver’s Cup Champion. 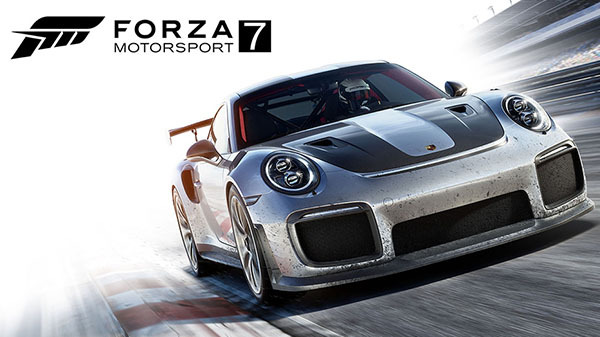 Ultimate Esports Experience – With new leagues, enhanced spectating modes, Beam integration and premiere partners like Porsche, Forza Motorsport 7 is the ultimate racing esports experience for players and viewers alike. Your Driver is a Personal Expression – Personalize your appearance with our massive driver gear collection, including hundreds of options spanning decades of race history and pop culture. Anyone Can Have Fun – From new players to esports pros, Forza Motorsport 7 is the most customizable game yet with new Assists and Mods designed to help all skill levels and unprecedented tuning for veterans to dial in the game how they like. Xbox is proud to announce the full details of the Standard, Deluxe and Ultimate Editions of Forza Motorsport 7, which are available to pre-order now at the Microsoft Store and from participating retailers. Deluxe and Ultimate Editions feature exclusive digital content that offers a competitive advantage right out of the box, as listed below. Watch the announcement trailer and a gameplay demo below. View the first set of screenshots at the gallery.